What's going on in this picture? Did the photographer add some special lens? Is this some kooky Instagram filter? Is the camera defective? Was it photoshopped? Maybe folded over and over? Nope. The stripes inside the photograph are actually painted like that in real life. The idea came from the process you do in the dark room when exposing different sections of the test strip to get the correct exposure. 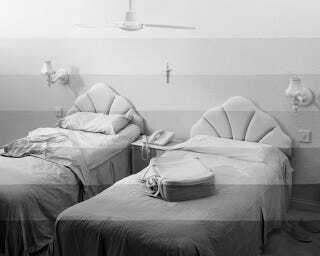 You end up with a striped image, each stripe darker than the next. So in these works instead of each line being exposed differently, they have been painted with different tones of grey. To achieve the test strip effect, the lines needed to be perfectly straight, so they were painted in perspective over the set giving the illusion that they are different levels of exposure.